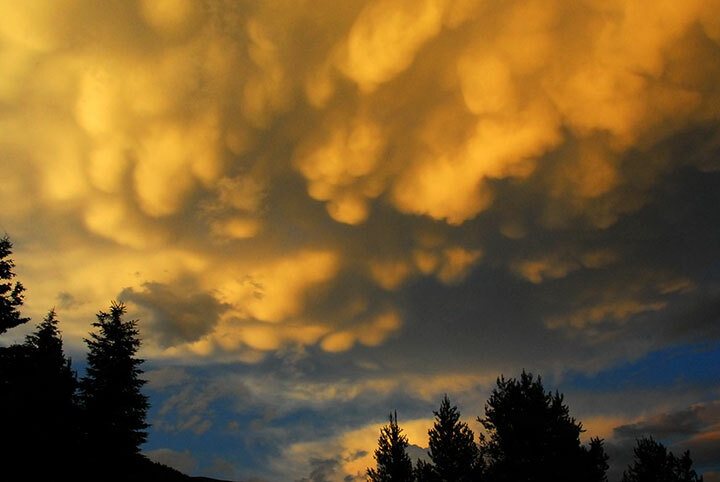 Cumulonimbus is a cumulus cloud which gives rain. The word, nimbus, means a dark cloud or rain cloud in Latin. 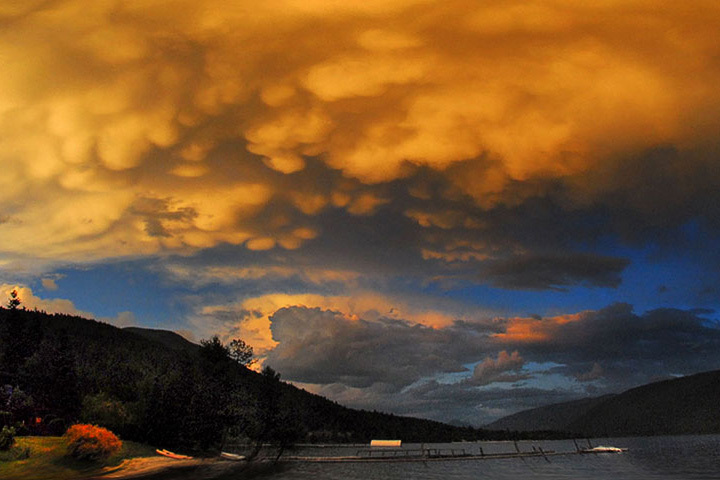 Often such clouds bring lightning and thunder, so they are also known as thunderstorms. Just as summertime is cumulus time, so it is thunderstorm time. Certainly, the cumulonimbus can be seen any time of the year, especially in the springtime, but the really superb storms are usually found in the summertime. These clouds can grow through great depths in the atmosphere, often extending through the troposphere to altitudes of ten or more kilometres. As with cumulus clouds, thunderstorms grow in an unstable atmosphere: an atmosphere in which a parcel of air that is displaced upwards, becomes buoyant and so is accelerated upwards (rather than returning to its origin). But, in the case of the thunderstorm, the instability extends through a much greater depth—virtually the whole troposphere. Adiabatic cooling The condensation in a thunderstorm is produced by vapour cooling. But the cooling, called adiabatic, involves no external heating or cooling. Rather, it is merely that as parcels ascend through the atmosphere, the pressure decreases, the vapour expands, and the temperature drops. The drop in vapour temperature results in the condensation. 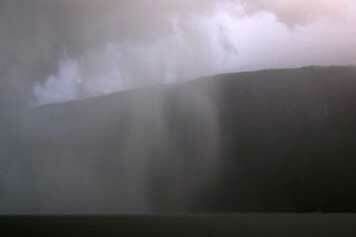 The thunderstorm can be thought of as a giant engine fuelled by water vapour. As with any engine, some of the energy of a fuel is transformed into motion. 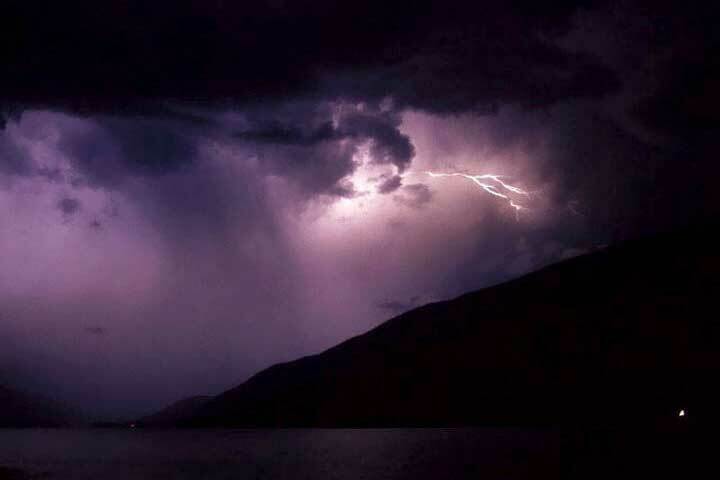 In the case of the thunderstorm, the conversion of the water vapour into rain provides the energy to drive the storm’s winds. The energy had previously been added to the water when the Sun evaporated liquid from the Earth’s surface. While the large cyclones and hurricanes are also fuelled by this conversion of water vapour into precipitation, most of the clouds we see don’t perform this way. The wave clouds, the (non–raining) cumulus, the steam fog, all involve the condensation of water vapour to produce the liquid droplets. But soon, the cloud evaporates, the energy is restored to water vapour leaving little net consequence. It is difficult to see the whole extent of this magnificent storm when it is viewed from the valley bottoms (this is indeed a case of the mountains blocking the view). 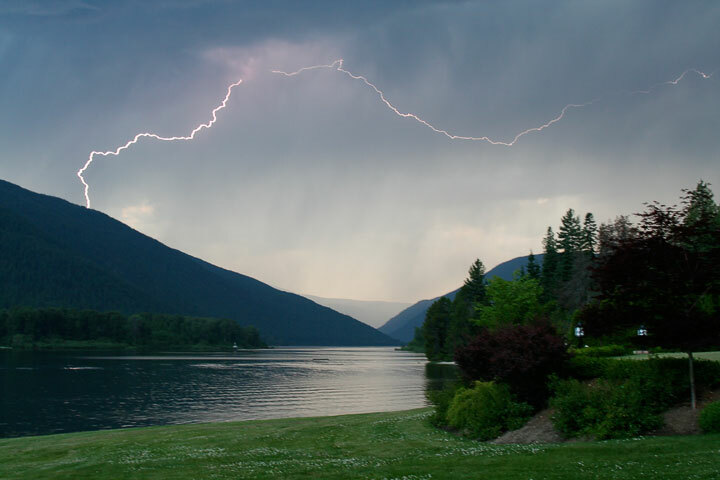 Yet, the view from the mountain tops also poses problems: a risk of being hit by lightning. Those who live on the prairies have a distinct advantage when it comes to thunderstorm watching. If the local overall view of the storm is not as grand as that enjoyed by those on the flatlands, the view of the details certainly is. And delightful details abound: anvils, mamma, rain, rainbows, grapple, hail, winds whipping up the white caps. They make for good observing and this page shows some of them. The thunderstorm takes place on a grand scale and so is often a bit difficult to see in its entirety from the the valley floor. 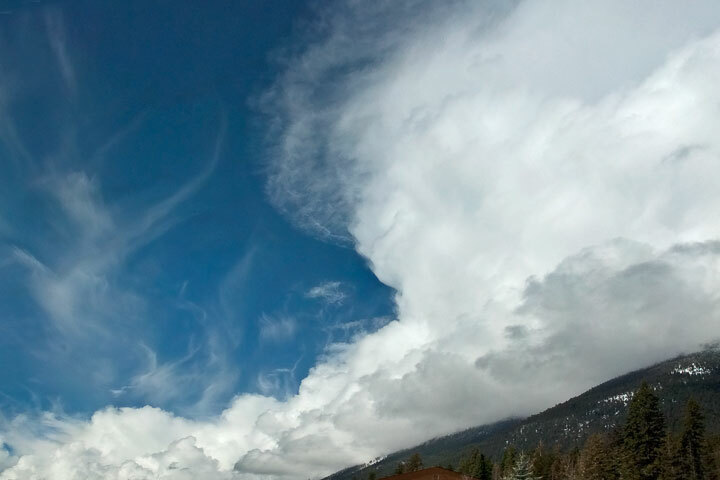 Yet, the towering cloud is evident on the right, as is the diffuse region at the top where the cloud drops have become ice crystals—a region which gains the name, the anvil. 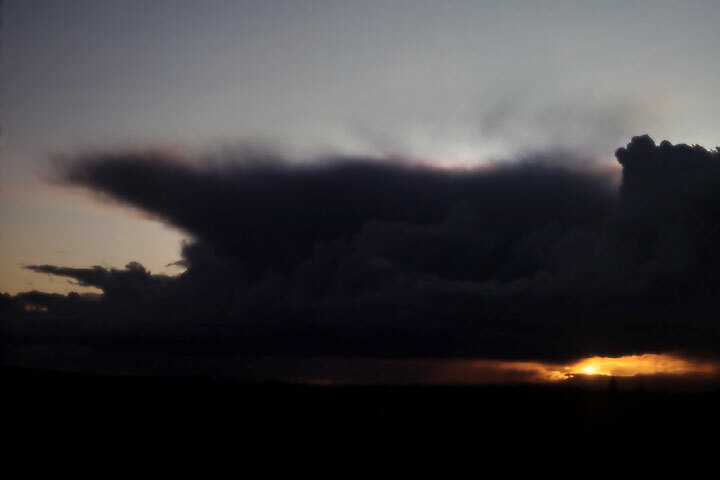 Thunderstorm anvil This silhouette of a thunderstorm was taken at the Coast. The anvil, the diffuse spreading top of the storm is clearly evident. The most spectacular views of mamma, occur when the setting sun illuminates it from below. 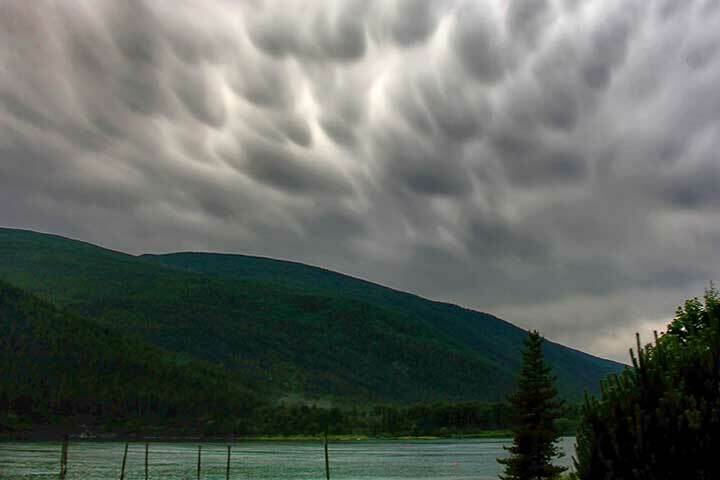 Mammatus, more often known by the informal name, mamma, are large pendulous structures that form on the base of a thunderstorm anvil. Named after a characteristic gland on mammals, they are caused by the precipitation which has been carried from the thunderstorm updraft out into the anvil. The heavy precipitation drags great pockets of air from the anvil down into the clear air below. As mamma is a structure on the base of a thunderstorm anvil, it is often missed because it is not well lit. In this case the anvil is thin and light shines through between the mamma. Hail shower Although, thunderstorms giving rain are common here in the summer, much rarer are those giving hail. As this storm moves east along the Arm, it trails curtains of hail. Most showers track along the Lake from west to east, but when they do cross over the mountains, they usually reach the Lake by descending the broad lateral valleys such as that of Duhamel Creek. 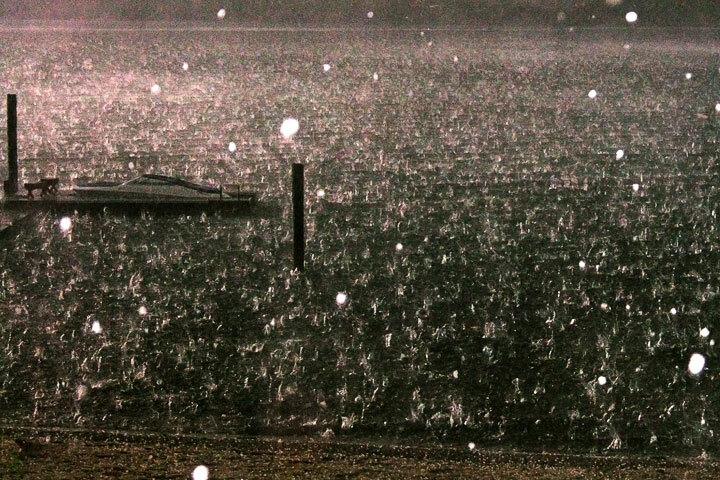 Hail The noise of 3-cm-diameter hail stones hitting the Lake is as impressive as is the sight. When a child, I once confused the sound of the hail on the roof of our lakeside cottage with the sound of Douglas cones being thrown down by squirrels—quickly the racket outstripped that possible from even an army of squirrels. 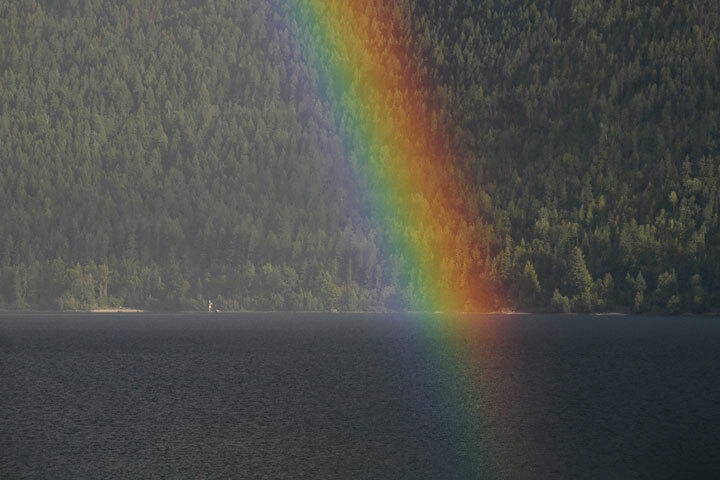 The rainbow, clearly one of the most beautiful features of a thunderstorm, is treated on this site with its own page: rainbows. Thunderstorm An evening storm moves eastward along the Arm. Lightning illuminates the rain streaks in the middle left. In this time exposure taken from Shannon Point, the dolphin lights at Five-Mile Point (right) and Seven-Mile Point (left) show.